This blog brought to you by Funhog Press. We were paddling steadily, racing darkness. Five miles yet to go, one hour until sunset; it would be close but our chances of making a daylight take-out looked good. 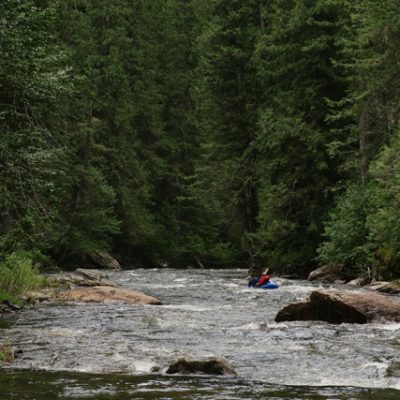 Lisa was just ahead of me bouncing down a shallow boulder pile when she queried, “Did we take the wrong channel or something?” The river did seem rather low, suddenly. 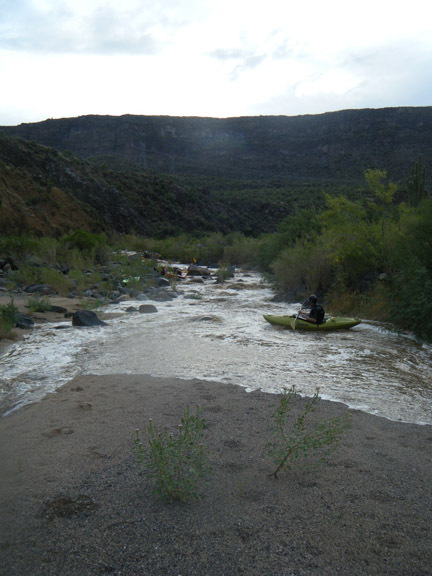 We both looked downstream to a riverbed of dry rocks and sand, and the realization struck us: We’re paddling past the water! I jumped out to take pictures. Nick Smotek drifted past riding the toe of the flood. Brown water filled the cracks between rocks and rolled across sandy bottoms in a shallow sheet of moisture. All seven of us pulled out to watch the phenomenon, and wait. We’d paddled as far as we could for now. Ten minutes later the water stopped rising. We speculated on the speed of the flood; two-miles-per-hour? three? Any way we sliced it, darkness before take-out seemed imminent. 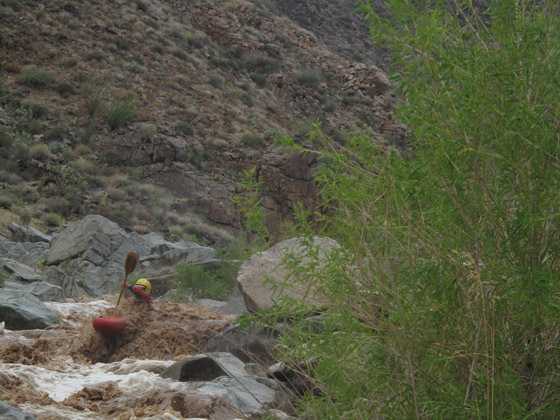 I suppose it was par for the Agua Fria, a river noted for producing epic whitewater days, and nights. What were we thinking anyway, when we stood at the put-in waiting for the water to arrive after 11 am? 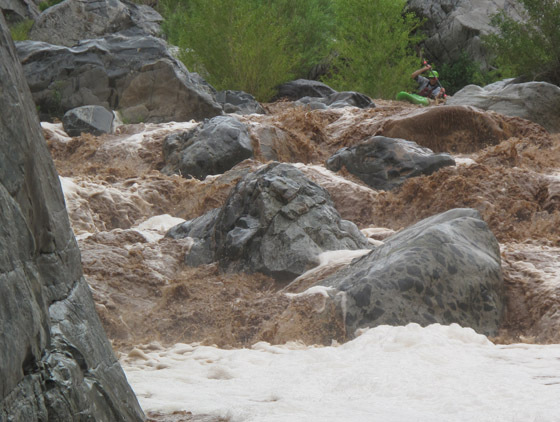 As I say in Paddling Arizona, “A noon put-in on the Agua Fria is likely to get you be-nighted.” But this was August. The days were long. My boat hit the water at 12:04. Yet that wasn’t all, our main man John Govi was still en-route. Nick would wait for him and they would move fast, catching the main group somewhere downstream. Questionable decisions were mounting. 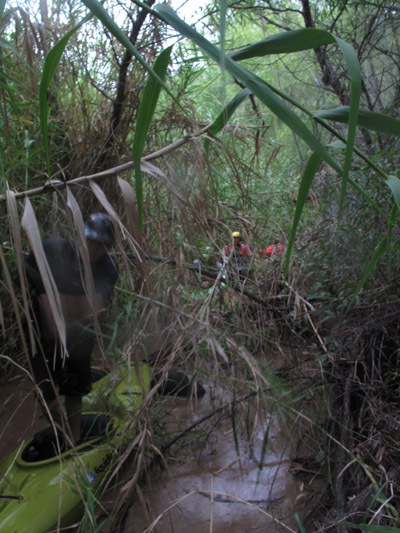 But this was the Agua Fria! Off we went. Pete Traylor, Matt Spahle, “Chevelon Bill” Langhofer, Lisa, and I methodically proceeded through cascades of watered granite, hoping our compadres would soon arrive. The water was its typical chocolate color. The level, however, was higher than usual. At Dugald’s Mystery Ledge, eddies were scarce, leading Matt to nearly drop into the unknown, backwards. He stopped desperately on a mid-stream willow at the lip, and Pete jumped out to assist. We all portaged. 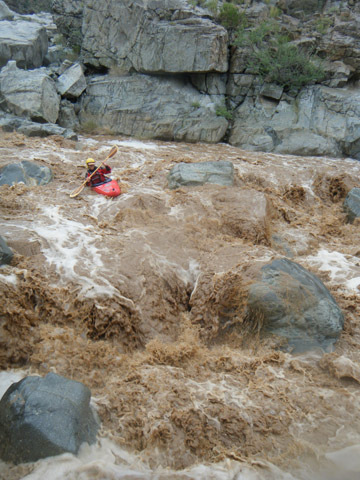 At Rail Slide, I took a new high water route. It was an ugly rock careening line, but at least I made the bottom in my boat. Lisa only emerged from the bottom hole once she was detached from her boat, paddle, and booties. She always preferred to paddle barefoot anyway. Following these unimpressive lines, nobody gave the falls a try, including Nick and John, who caught us shortly thereafter, at Double Boof. Despite a couple more portages and two swims at the last big rapid—Low Blood Sugar—we were all in one piece and on pace for a twilight take-out when we paddled off the nose of the flood, and were forced to take a break. Fifteen minutes later we set off, only to out-pace the water again in another ten minutes, this time amidst a jungle of cattail, willow, and cottonwood. A laborious extrication from the swamp led to a beach where we dropped the boats. Out came the map. Off Pete went, striding into the desert to seek the jeep trail that supposedly existed there. Minutes later he returned with good news. The road was an affirmative. Four of us left our kayaks tied to a mesquite tree. The other three dragged theirs. Dusk crept over the desert. We marched into the night. An hour into the walk we spotted a light in a ranch house. I called out until a stout Mexican-American man emerged. He understood my plight relatively quickly, mumbled something about a key, and disappeared back inside. Unsure if our rescue was at hand or not, I shuffled in the dark while the crew waited at the far end of the pasture. The man re-emerged, wearing his cowboy hat. This was a very good sign. 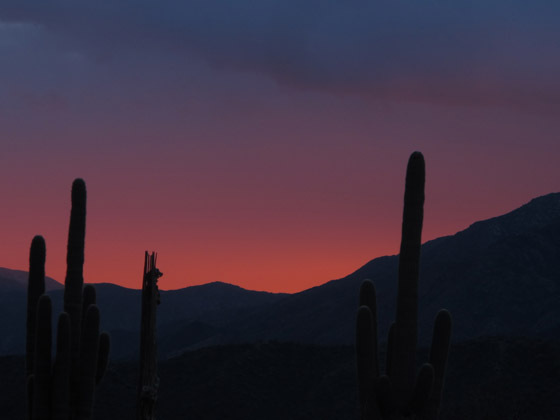 Before long we were piled deep in the back of C.D.’s pickup, headed for Black Canyon City. Several minutes of small talk passed before he told us a story of another band of kayakers he once met. It was during winter, he said, and after dark, like this. Those paddlers demanded the use of a truck. C.D. answered them with the pump of his shotgun. Relations slowly improved from there. He ended up giving them a ride, just like us. I grinned. The incident of which he spoke was an adventure of the late Jim McComb. His wife Jodi called me that night, probably about the same time they were getting the ride from C.D. It doesn’t seem long ago but it must have been before cell phones. It probably doesn’t seem long ago to C.D. either. Back in Bill’s truck, I shared C.D.’s story to a jocular reception. 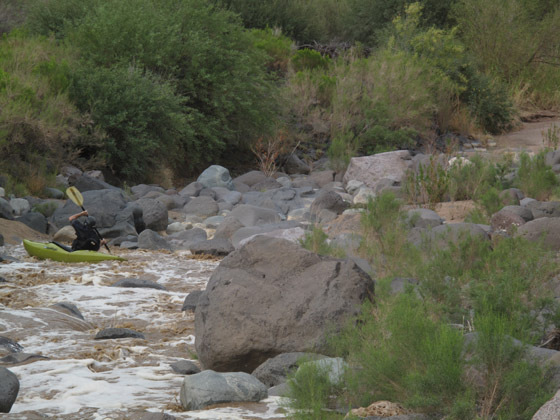 We missed Jim McComb on this Agua Fria epic, but one way or another, he was still there.